Eleanor Catton was only 22 when she wrote The Rehearsal, which Adam Ross in the New York Times Book Review praised as “a wildly brilliant and precocious first novel” and Joshua Ferris called “a mesmerizing, labyrinthine, intricately patterned and astonishingly original novel.” The Luminaries amply confirms that early promise, and secures Catton’s reputation as one of the most dazzling and inventive young writers at work today. Catton holds an MFA from the Iowa Writers’ Workshop and an MA in fiction writing from the International Institute of Modern Letters. Born in Canada, Catton was raised in New Zealand, where she now lives. 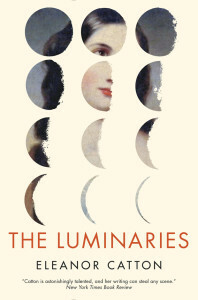 The Luminaries is available for immediate purchase via these links to Amazon.com and Amazon.de. When you make a purchase via this website, a percentage of the price goes right back into site maintenance and development. Thanks for the support! I have only read the first 100 pages but am fully sucked into this book! I am trying not to read late in the evening as I know it will keep me up to all hours! Agreed. She is a masterful storyteller. Intrigued as to how she chose this setting and complement of characters to create. I think her creation of such a complete world/philosophy is masterful.